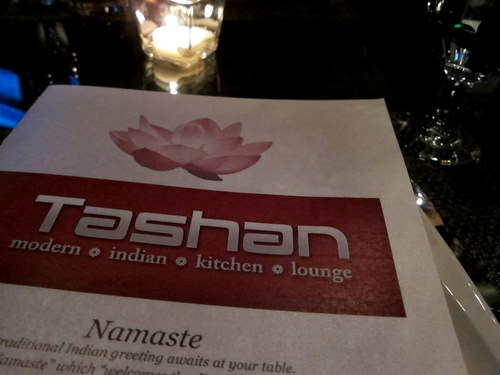 I really knew nothing about Tashan before going there. I didn’t even realize it was under that apartment building on Broad street. Foobooz wrote an article the other month about Tashan being an awesome restaurant that people just aren’t going to. I can see a few reasons for their uphill battle: location on Broad being a bit further south than most of the hubbub, Indian food done “fancy”, and Indian food not cheap. But the food, oh, the food, is why everyone should be going there. Yes, it’s Indian food in a fancy setting, with prices a bit higher than your local take-out joint, but the food is daring, experimental, and exciting. And the place is absolutely huge and beautiful, with a giant bar, big open kitchen, and lounge area. The menu is a mixture of small plates and a few entrees of things you wouldn’t find in a typical indian joint. Yes, there’s tandoor items and naan and such, but there’s so much more! We started with Pacific Coast Tandoori Jumbo Shrimp. These are some huge shrimp cooked in a tandoori oven with herbal fenugreek, toasted yellow-pea flour, and a basil-seed-coco yogurt. They’re great! Indian food? They’re certainly indian-ish, but could really have been found on any cool restaurant’s menu. I pretty much like to eat anything with tentacles, so I had to get the baby octopus dish. It’s a Nicobari spanish rock octopus, braised in a red bell pepper sauce. It’s delicious! 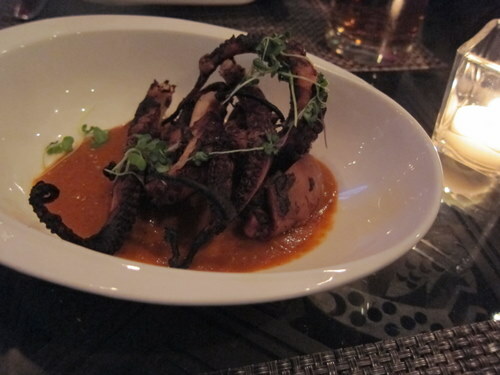 The sauce is awesome and the octopus is tender and smoky. And it’s a really heaping serving. But I guess if you’re wary of tentacles, then this isn’t the dish for you. They do not try to hide the fact that these are what they are. Again, not very indian food-ish, but quite tasty. Here is the Chilka Lake Wild Black Bass. 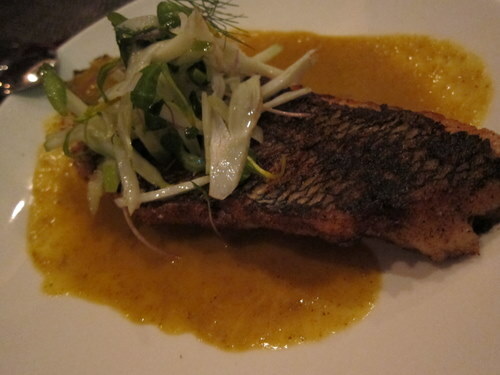 It is pan-seared with a traditional Oriya curry froth, and apple-fennel salad. This is fish done as it should be. It’s a nice chunk of fresh bass, firm and flaky, with a light and crispy skin. The curry froth was light so that it complemented this white fish nicely. The salad was a crisp and tart contrast. Since the other dishes seemed more non-indian, we decide to balance that out with a really accessible indian favorite, Butter Chicken. This features free-range tandoori chicken with the butter chicken tomato cream sauce we’ve all grown to know and love. Oh my, oh my, it’s just so good. 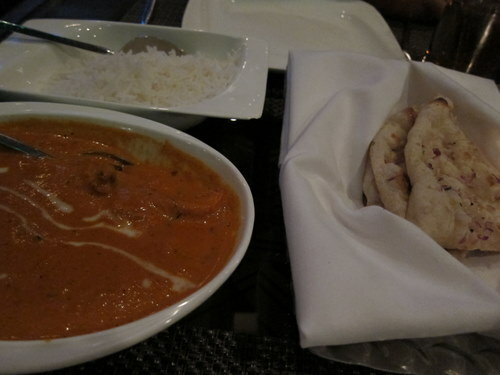 The chicken is super tender, the sauce is divine, the naan is great. The basmati rice is basmatirrific. Really, there’s nothing bad you can say about this. Tashan has their desserts and drinks on an iPad. We didn’t see the donuts on the iPad list and got a little bit sad, as that’s one of the things we knew we wanted to try. Technology lied! They actually did have the donuts, and we were back to smiling again. These are the Masala Donuts. 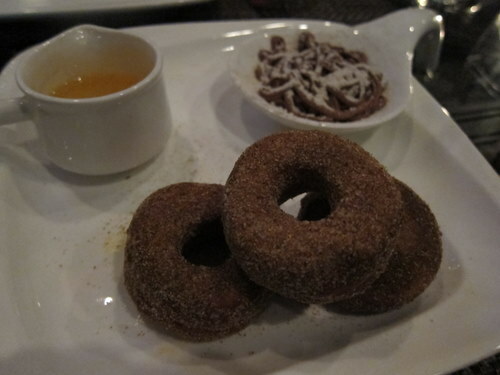 They are regular cake donuts, but flavored with 12 spice fennel sugar, and served with chocolate mousse, and cardamon syrup. Yes, you can say they’re indian style donuts. And I officially love me some indian style donuts. 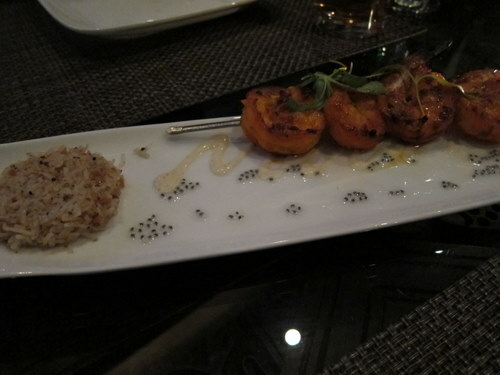 If you like fine dining and want to try some innovative indian-esque cuisine, please give Tashan a try! It’s also sometimes nice to eat indian food not in a tiny pocket-sized takeout joint. The space is beautiful on its own and even has tons of lounge space. To me, it’s worth the visit and the pricetag. And I’m not even going to mention the bathroom shenanigans I witnessed while I was there. I went to the restroom and saw a girl in a stall open her door and another guy go into her stall. These are full-sized doors so you can’t see anything through it. Both of them were employees of Tashan. Who knows what ensued next. They certainly didn’t seem to care that I totally saw them. Tashan – for all kinds of drama! fe and by “real” folks, rather than the seasonal luggage that are featured alongside models within the company’s ancient ad campaigns. during this case, four-year-old C.J., son of Laila Ali (a champion in her own right), stands tall close to his proud grandfather, who features a Louis Vuitton Monogram Canvas Keepall serving as a luxury gym bag at his feet. The ads seem to be simply the primary component in Ali’s involvement with Louis Vuitton – investigate a teaser video with him and Yasiin Bey (who you may recognize higher as Mos D.Louis Vuittonef) once the jump. that point of year again: time for ad campaigns! I walk by this place almost every day with the dog and it’s pretty intriguing! Thanks for the review– the food looks gorgeous, can’t wait to give this place a try!